Spacious yet Lightweight backpack for multipurpose use. 1.This backpack is a perfect space saver. Fold and stuff the bag into your luggage, and take it out when you reach your destination. 2.It's a perfect organizer with multiple compartments and pockets. 3.Sturdy and the absolute perfect size with a stylish look, this packable go-anywhere pack is for super-minimalists who make every gram count. 4.Durable Packable Washable. perfect for day-to-day use or occasional travel. adjustable breathable straps make it easy and comfortable to carry for all day use. 5.lightweight,Water Repellent and anti-tear nylon cloth with fabric Lining,very easy to clean. 6.Four most classic and popular colors for your choice Black, Sapphire Blue,Burgundy,Purple,Watermelon Red. WATER RESISTANT AND DURABLE:The backpack is made from highly rip and water resistant nylon fabric, provide strengthen and long-lasting performance with minimal weight. MULTI COMPARTMENTS. The backpack with several pockets for storage and organization. 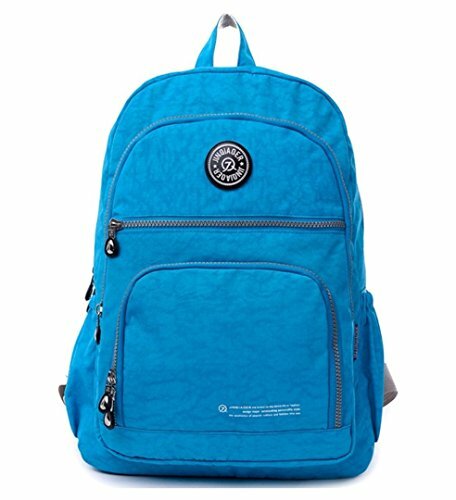 It has a roomy main compartment with a laptop divider,3 pockets and 1 key chain.Three front zipper pockets which are great for quick access such as guide books and camera.Two side pockets for water bottle or umbrella. LIGHTWEIGHT AND FASHIONABLE:Weight: Around 0.95 Pounds.10 colors are available:Black,Rose,Purple,Sky Blue,Pink,Green,Burgundy,Navy,Light Blue and Sea Blue. DEMENSION: 12"L x 16"H x 6"W. It can hold up to 14 inches laptop. If you have any questions about this product by Big Mango, contact us by completing and submitting the form below. If you are looking for a specif part number, please include it with your message.